SeQent’s FirstPAGE Alarm Manager (FPAM) product line adds a sophisticated Alarm and Event management engine to our FirstPAGE product line. FirstPAGE Alarm Manager Server, combined with various FirstPAGE Alarm Manager Gateways, form a homogeneous environment easily managed from a centralized location. The FirstPAGE Alarm Manager Server allows for the execution of a messaging hierarchy including repeat messages as events age, the delay before sending an initial message to ensure the event is not transient, and multiple levels of escalation. FirstPAGE Alarm Manager only requires the source system to report “alarm active” and “alarm inactive”, for any alarming event. Additional logic need not be added to the process control solution (i.e. PLC or HMI/SCADA system) or Building Management/Life Safety Systems to provide a very robust escalation tree. Easily scalable to handle thousands of alarms per hour, a single FirstPAGE Alarm Manager Server can be used to dispatch alarms from 20+ homogeneous or heterogeneous gateways. A sophisticated alarm management engine providing wildcard base alarm rules, templated escalation schemes and message composition. 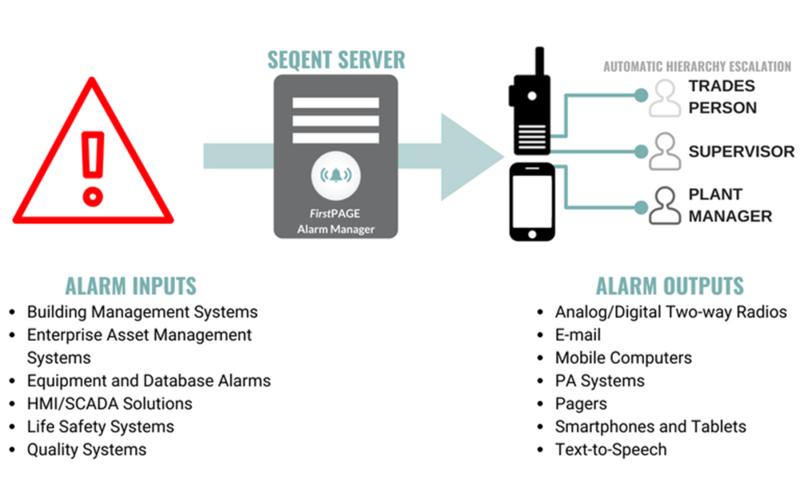 Managing the life cycle of alarms from initiation to termination FirstPAGE Alarm Manager Server is the heart of the SeQent alarm management solution. Starting with FirstPAGE Alarm Manager Server as the foundation, select one or more FirstPAGE Alarm Manager applications to provide application alarm queue routing or collect raw data values to establish business rules for alarm triggering. Provides a window into the current status of all active alarms within FirstPAGE Alarm Manager. FirstPAGE Alarm Manager Gateway for Activplant provides a real-time bridge between Aptean’s Activplant Incidents and FirstPAGE Alarm Manager. FirstPAGE Alarm Manager Gateway for ANS is a replacement for the Ford ANS Server and provides BEA MessageQ, TCP/IP and WebService interfaces for ANS enabled applications to remit alarm and text message requests. FirstPAGE Alarm Manager Gateway for CIMPLICITY provides a real-time bridge between General Electric CIMPLICITY Plant Edition project alarms and FirstPAGE Alarm Manager. FirstPAGE Alarm Manager Gateway for COPA provides the ability to gather data from one or more COPA compliant servers, define business rules which constitute alarms and limits, and sends alarms to FirstPAGE Alarm Manager. FirstPAGE Alarm Manager Gateway for FactoryTalk A&E provides a real-time bridge between Rockwell’s FactoryTalk A&E alarms and FirstPAGE Alarm Manager. FirstPAGE Alarm Manager Gateway for FactoryTalk HMI provides a real-time bridge between Rockwell’s FactoryTalk HMI alarms and FirstPAGE Alarm Manager. FirstPAGE Alarm Manager Gateway for FileSystems provides the ability to gather data from one or more Windows mounted file systems, define business rules which constitute alarms and limits, and sends alarms to FirstPAGE Alarm Manager. FirstPAGE Alarm Manager Gateway for InTouch provides a real-time bridge between Wonderware InTouch alarms and FirstPAGE Alarm Manager. FirstPAGE Alarm Manager Gateway for ODBC provides the ability to gather data from one or more ODBC compliant database servers, define business rules which constitute alarms and limits, and sends alarms to FirstPAGE Alarm Manager. FirstPAGE Alarm Manager Gateway for OPC provides the ability to gather data from one or more OPC DA or OPC HDA compliant servers, define business rules which constitute alarms and limits, and sends alarms to FirstPAGE Alarm Manager. FirstPAGE Alarm Manager Gateway for RSView32 provides a real-time bridge between Rockwell’s RSView32 alarms and FirstPAGE Alarm Manager. FirstPAGE Alarm Manager Gateway for System Platform provides a real-time bridge between Wonderware System Platform alarms and FirstPAGE Alarm Manager. FirstPAGE Alarm Manager Probe for Email is a hardware appliance designed to confirm email operation, specifically over Wi-Fi networks. FirstPAGE Alarm Manager Probe for SMS is a hardware appliance designed to confirm SMS/carrier operation.